Welcome to our support page. You can contact us for support using one of the email addresses below, but we recommend you check out the FAQs and video gallery before hand to make sure your question hasn't been asked before. You may also find the Online Help Book to be of assistance. MemoryMiner 2 Quick-Start Guide: This video steps you through the basics of importing photos, annotating them, and in the process creating reusable People and Place objects. MemoryMiner 2: Using Collections: Learn how to create and update ordered collections of thematically related phoots. Publish them to the web using the beautiful MemoryMiner web viewer, and see how to update the published content after you've made changes on the desktop. MemoryMiner: Keyword Mapping: Learn how to automatically associate photos with MemoryMiner People & Places upon import using keywords that you added in iPhoto, or that are embedded in the files using Aperture, Lightroom or other applications which support the IPTC standard. 1. Do I need to use iPhoto? MemoryMiner is a great complement to iPhoto or other photo management applications such as Lightroom or Aperture. However, you can happily use MemoryMiner all by itself. Whenever you import a photo into MemoryMiner it will reuse as much descriptive data that may already exist about each photo. Typical sources of this data are the file itself, which could have dates, titles, captions, place names, etc. embedded in the files using any of the EXIF/IPTC/XMP standards. 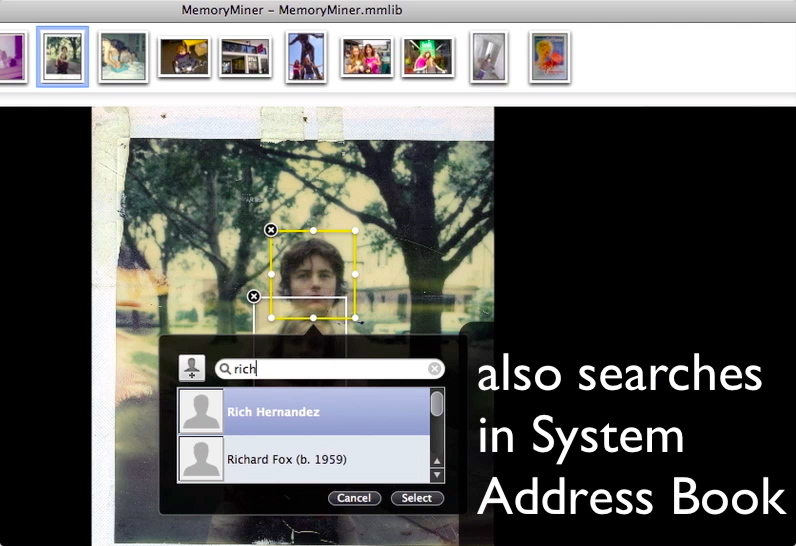 If the photo is being managed by iPhoto, MemoryMiner will ask iPhoto what it knows, including face information. 2. I can't get a map for my address? MemoryMiner uses Google Maps in order to try to determine the latitude and longitude of a given address, or city. If you are unable to get a match for a given address, there a few things you can do. First, make sure that there's no "Apartment #" or similar component to the street address. Second, you can try omitting the street address altogether, in which case a location for the City can be substituted. If that doesn't work, remember that you can manually pan and zoom the map, and move the red map marker to pinpoint the place you're looking for. 3. I bought the software: why haven't I received my license file? License registration codes are delivered via email from our web store. If you haven't received your registration email, there's an excellent chance that the email ha been mistaken for "junk mail" and can be found in your Junk Mail box. The sender is "sales@memoryminer.com." If this is not the case, and you haven't found your registration email, send email to support@memoryminer.com and we will forward you a copy of your registration email to you. 4. Where does MemoryMiner store its data? If you use the Timemachine, or other similar application to back up important files, you'll want to back up your MemoryMiner library documents. 5. Does MemoryMiner handle video? 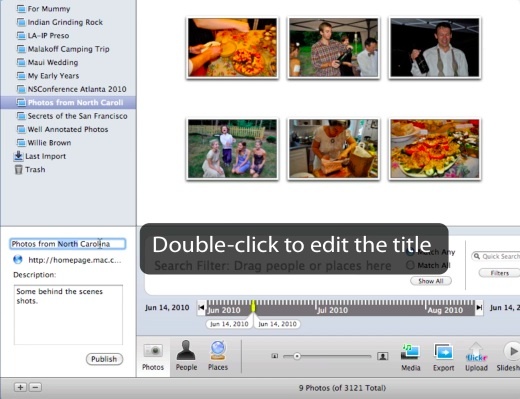 You can attach any media file, such as a Quicktime movie, to a photo. With version 2.0, you can directly record audio and video attachments to a photo. Keep in mind that you must have some photo, even if it's just a placeholder to which you attach an audio or video file. 6. How do I attach a URL to a photo? URL's can be dragged from the Location bar of your favorite web browser and dropped onto a photo that's being annotated. Further, the Media Browser has a book marks tab which lets you drag and drop URL's that have been bookmarked in Safari or Firefox. 7. Can I upload a MemoryMiner web export using an external FTP application such as Transmit? You certainly can do this, but there are important caveats. There is an Export button on the Photos toolbar which lets you export the currently displayed photos to your local hard drive. You are free to then upload the folder to your web server. Keep in mind though, that the RSS feed that is created will not have the correct URL's for the individual photos if viewed in an external news feed reader such as Google Reader. The MemoryMiner Web Viewer code is smart enough to deal with this, other RSS readers won't be able to. This may not be an issue, but it is something to keep in mind. Furthermore, the Sharing overlay will also have incorrect file:// URL links. For some reason, web mail clients such as Gmail or Hotmail will change the name of the MemoryMiner license file when you download the file to your local machine using a web browser. The license file name should be MM2License.mmlic. Check to see if the web browser renamed the file to MM2License.mmlic.xml then remove the ".xml" extension. You should then be able to double-click on the license file and have it launch MemoryMiner (if it's not already running) and show you the license confirmation screen. By all means, ask away using the support email address shown above.